As usual, time is flying by. This is already week number 8 of the 12 Weeks of Winter Squash. I imagine many people are swamped with Christmas preparations, so I'll be interested in seeing how many squash dishes make it to the table in the midst of all of that madness. It's no different here, so I went with a ridiculously simple preparation. I have a couple of squashes hanging out in the kitchen right now. And for the most part, they're polar opposites. One is a big, scary (but beautiful) Blue Hubbard. Scary because I need a machete to break into it. This just wasn't the week for that. I have a few more weeks to decide what will become of it, I suppose. And the second was a small acorn squash. Well, obviously I chose that one. I almost stuffed it. Almost. Admission time - I have never stuffed an acorn squash before. I know! That's pretty much the first thing people do with acorn squash, right? Well, not me. I've always sliced and roasted it with one thing or another. This time was no different. I roasted it again. Just cut it into chunks and tossed it with some chorizo seco that I found at the Mexican market the day before. I can't resist long strands of homemade sausage hanging from the rafters. Together, the two made an awesome taco filling. When in doubt, stuff it into a tortilla. 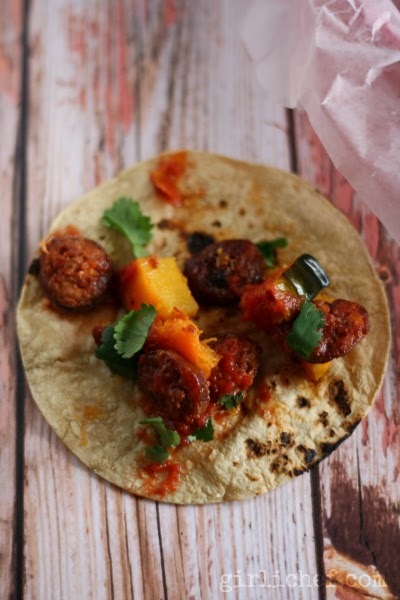 The sweetness of the squash and the spiciness (yet tame - the drying tames the heat) of the chorizo were sort of meant for each other. Preheat oven to 425° F. Line a baking sheet with foil, or have a 12-inch cast iron skillet ready. Slice the chorizo seco into 1/4-inch slices. Scrub the outside of the squash, then remove the seeds (for at least the half you're using). Cut the half squash into 1-inch chunks. Toss both the chorizo and the squash onto the prepared baking sheet or into skillet. Drizzle with enough olive oil to coat everything. Sprinkle with a pinch of salt (the chorizo may be salty, you can always season more later) and some pepper. Slide into preheated oven and roast for 20-30 minutes, tossing everything around halfway through baking time, until the squash is tender and browned in spots and the chorizo is cooked through. 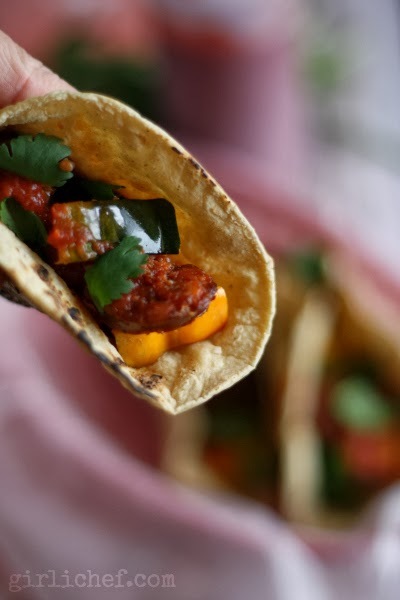 In the meantime, you can heat up the corn tortillas; I like to do it over the open flame of my stovetop burners, but you could also wrap them and microwave (steam) them. Hold in towels or a tortilla warmer. 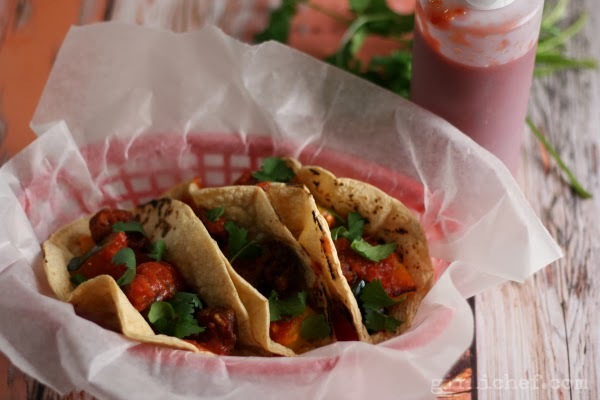 When everything is done, scoop some of the filling into a tortilla, dribble with salsa, and rip some fresh cilantro over the top. Enjoy. Chorizo seco is literally dry chorizo. It is still the "fresh" Mexican variety, but you will probably purchase it from the butcher counter hung from the ceiling. By name, it is much drier than the variety kept in the cooler. You still need to cook it. If you can't find it, you could substitute fresh, crumbled that has been cooked in a pan while the squash roasts. If you have it, crumble some queso fresco over the filling, as well. 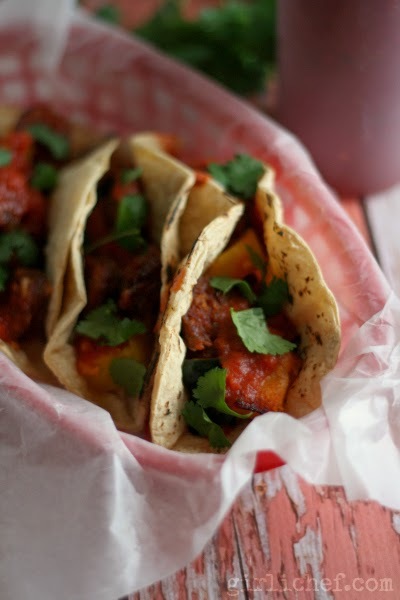 The slightly spicy chorizo and the sweet acorn squash complement each other nicely. Black beans (whole or refried) would also be a nice addition here, as well as some cool crema to top it all off. Week 8 of the 12 Weeks of Winter Squash is here! I'm so happy to be co-hosting with my friend Joanne of Eats Well with Others, again this year. We'd love it if you'd cook/bake along with us over the next 12 5 weeks. We will be sharing a new winter squash dish every Monday, but you can feel free to link up a squash dish that you've made anytime during the week, as the linky tool will be open through the end of the day on Sunday. Or, if you're a blogger, and would like to post along with us on Mondays, just let one of us know so that we can add you to the group!